Recently Cecilia Gutierrez Venable, our historian and archivist, was interviewed for the Texas Public Radio program “Fronteras” about our Congregation and a new book. 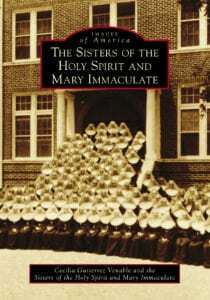 Cecilia and our Sisters have compiled and published Images of America: The Sisters of the Holy Spirit and Mary Immaculate (Arcadia Publishing) to mark our 125th Anniversary. It presents our founding and history in photos from the archives and from the personal collections of the Sisters. You can hear the interview with Cecilia here. It is the third story in the June 29 episode of “Fronteras,” and it begins at the 14:40 mark. You may purchase the book at Arcadia Publishing.